COLUMBIA - Open pools means play time for many people in Columbia but Parks and Recreation is still hard at work to find more lifeguards. 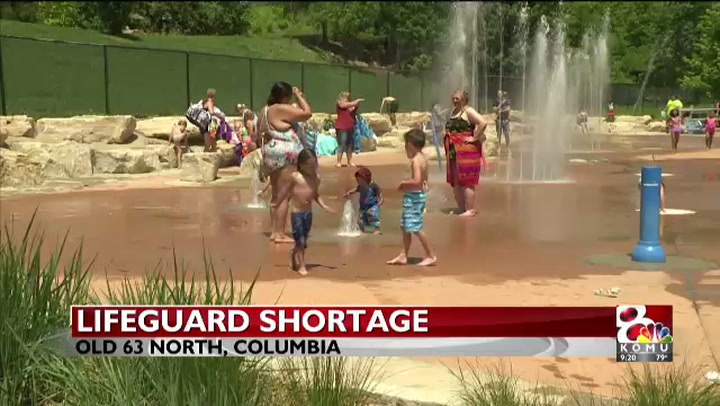 On Friday, Columbia's Parks and Recreation opened pools to the community, but Aquatic Supervisor Janel Townhous says they are still short staffed. "We do have 29 positions that are open," Townhous said. “With us having six aquatic facilities, four outdoor pools and two indoor pools, we’re always in need of aquatic staff." Townhous said the shortage does not affect their number one priority, which is safety. "We have zero tolerance for any mishaps within an aquatic facility. We should hopefully be able to prevent an accident from happening." Parents can be a great help to lifeguards by making sure children are playing safe at pools and spraygrounds. Townhous said parents should pay very close attention to their children. "It only takes a second for you to turn your head. Literally it takes a second," Townhous said. "Bottom line is being very vigilant and watching their kids all the time when they're in or around water." Sterling Brown, a Columbia parent and frequent pool visitor says he already does what Townhous suggests. “I will sometimes stay out of the water just to not be distracted by playing with my daughter or some other kids or whatever, just to keep an eye on my daughter. If you can see me and hear me I feel that I can get to you if you're in any danger. Brown says even though he watches his children closely, he hopes the city is working hard to fulfill the need for lifeguards this summer. “Two or three kids out there were asking me if I was a lifeguard today. I had the towel over my shoulder so it just looked like I just had a red t-shirt on," Brown said. "They have to do something because it’s definitely something that kids look for and target as a point of safety for themselves." She said if anyone is interested in being a lifeguard they can apply online.